Fondly called the ‘Queen of Hills’, Mussoorie is a prominent family holiday destination since colonial era. Located amidst the quaint valleys and lakes of Mussoorie is Royal Orchid Fort Resort. The hotel is situated at close proximity to the major tourist attractions such as Gun Hill Point, Mossy Falls and Mussoorie Lake. 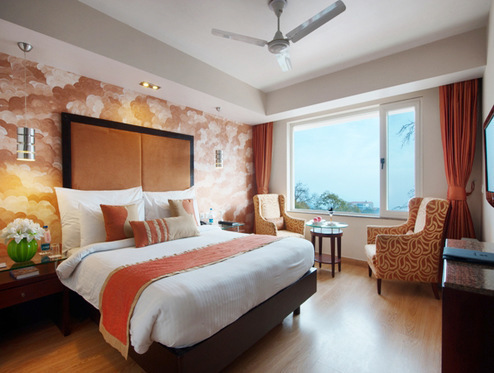 It is also one of those resorts in Mussoorie, which is around the city’s major business hubs. Royal Orchid Fort Resort houses numerous banquet halls with modern facilities to ensure hassle-free meetings and events. It also features 56 rooms and suites that have the comforts for all modern day travellers. It also features a dining outlet, ‘Pinxx’, which is a multi-cuisine restaurant. It has a spa and a gym for your recreation. Book 2 nights 3 days and avail plethora of services. Royal Orchid Fort Resort is home to multiple banqueting facilities that also offers ample parking space. These venues are ideal for Weddings, Conferences and Events. Our resort is perfect to plan your theme based destination weddings. Our classy venues are equipped with state-of-the-art facilities to make your events a successful and grand affair.